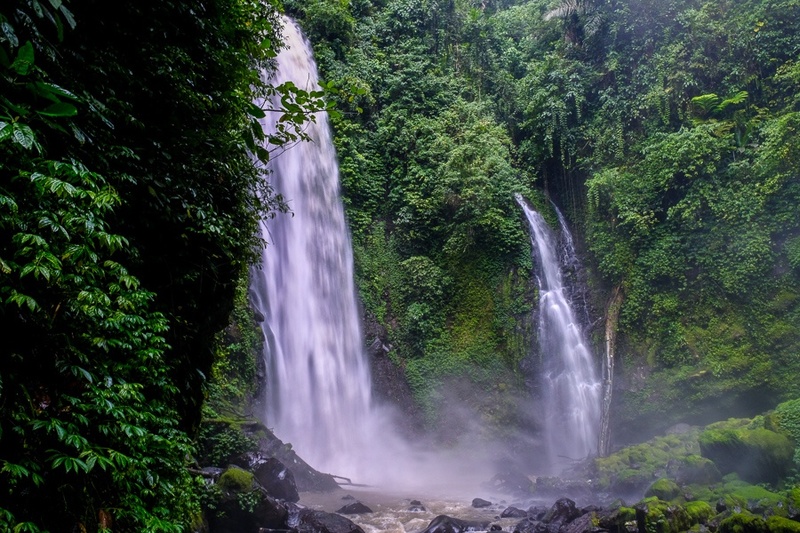 Kali is one of the more well known waterfalls in the Manado area, and it’s pretty easy to reach with a short drive and hike. You can get here by scooter, but I think it’s a better idea to combine this with some other places in the Manado area and do a full day tour with a guide. The road to get here cut through some rural villages and stopped by a group of shabby houses where some locals were singing Gospel songs. After a VERY humid hike that had us drenched in sweat, me and my guide reached this massive twin waterfall deep in a ravine in the jungle. Pictures don’t do it justice! On the way, we even saw some rare Sulawesi macaques hiding in the trees. Kali waterfall is in north Sulawesi, just a 40 minute drive from Manado. The hike to the falls from the parking area is steep and strenuous, but not dangerous, and only takes about 20-30 minutes. If you need help, the locals are super friendly and you can ask for directions to Kali waterfall (‘Air Terjun Kali’). As of 2019, there’s no parking or entry fee for visiting the waterfall.